Syncopated thank you so much.. Wonderful! This is a very happy and engrossing story, Nonoy! Thank you for spending time reading my post. Your comment is very much appreciated. Wow Nonoy your story was so wonderful, the ending was lovely (made me smile) I love your drawing, the reflection in the mirror is such a cool touch! Kelly I’m glad you like it. Your comment means a lot to me. Many thanks to your support. David I’m glad you like it. Thank you. It’s a Nonoy time. Great writing! Thank you I’m glad you like it. Always! I like every story you write. How em I going to answer that…. Madame Jenny It’s hard to tell I’m the 3rd party. Anyway thanks for the warm comment. Do not give up Nonoy! Wow, is this a true story? If so, don’t give up on her! Whoever this guy is, he’s over and done with! You’re here and now! William thank you. Your comment means a lot to me. Seriously man! I wish I had half the guts you demonstrated there. Hope it all works out, you’ve earned it. The problem with the real world it’s not like in the movies or a pocket books. I am competing with a worthy adversary. Jaguarod I’m glad you like it. Just sharing the complexity of the affairs of the hearts. Thank you so much. HOw sweet it is…… I remember boy but I don’t remember the feelings anymore…. GOOD LUCK NOY KEEP IT UP. WHAT A NICE TEAM UP. you remind me huh! anyways Good luck both and keep it up! actually I like it all. I am proud of you guys to have a friends that inspired everyone. God Bless! thank you tita loise for your kind words. I have to say ..I love this story..I sincerely hope this is True and I wish if you best if you have found ur true love..Cheers Buddy. As usual ur story is amazing..
thank you to your very encouraging comment. Again, you impress me! I love both the story and your illustration. I wonder what comes next in this saga?! You always make me happy to come by and read. I really enjoyed the tale. I’m a sucker for love stories. Thank you too for coming by and reading my latest post. Yousei hime Thanks for the warm comment. If your a sucker for love stories, I’m a sucker for the affairs of the heart sometimes I don’t even think what the consequences. I think everybody got addiction LOL. I love this story. The idea of trading marvel comics drawing lessons for manga sounds like a sweet deal. I agree it saved my mother a lot of money sending me to special summer school to study marvel drawings. Thank you so much for reading my post. Oh my gosh, IT’S SUCH A CUTE STORY!!! >.< Kawaii! Lily thank you so much for your time reading my post. It’s a really good post! Very sweet little love story you have here! Made me miss my puppy love during grade school. Many Thanks for your wonderful comment it means a lot me. 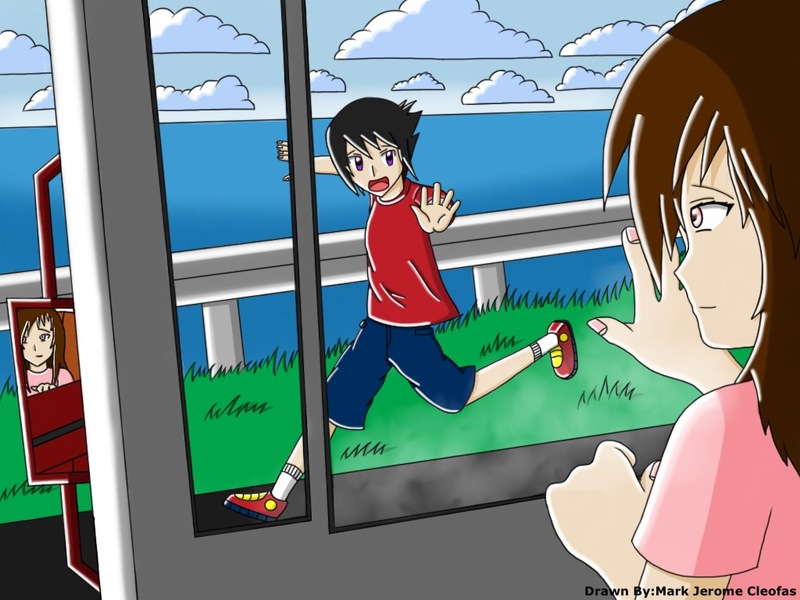 i really wish that happen or perhaps the bus stop then she step out of it. but things like that mostly happen in the movies real life is little bit tougher. thank you so much for your interesting comment. Madame Sherry K. your comment means a lot to me thank you. absolutely wonderful Nonoy!! wow, you have such talent! Very lovely story Nanoy, made me smile, I had a similar experience to this when I was younger. Thanks for the great story! Nofosu that’s awesome, you made my day. i’m glad you like the back story. thank you. sometimes in the game of love, win ,lose or draw. you just have to live the moment. just enjoy the most of it. Ah…The complications of Life and Love. A good story and fantstic graphics. Keep it going Nonoy…. You nail it sir, what a warm comment I like that. nicely written. is it true? I have nominated you for the commentator award. Please stop by my blog- http://www.boomiebol.wordpress.com for details on how to accept if you choose to. Thank you for your continued support, it is highly appreciated. Boomiebol Thank you so much. My absolute pleasure!!! I am a fan! Oh ya what a coincident about the title. I’m glad you like the story. Thank you so much. Intriguing story of love pursued and found . Great piece N.
Sweeet! 🙂 Great work Glad to have found you. Thanks for visiting my bog and leaving me a comment.